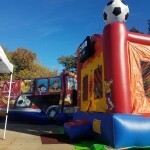 Jump City’s Sports Arena bounce house offers it all: a football, basketball, soccer, and baseball theme to score points with any novice player or sports fan. Ideal for sporting events, sport camps or after the big game, this bounce house will keep players entertained for hours on end. 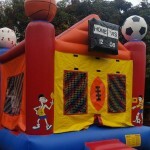 The bounce house features a three-dimensional basketball, football, baseball and soccor ball – one atop each tower, and a fun scoreboard. 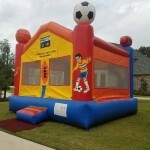 Bounce house is one product in a fantastic line of sports-related bounce houses delivered to Plano, Dallas, Frisco and a stadium full of other Texas Cities, like YOURS.